The Croft is a tranquil courtyard of four cottages and two bungalows situated within the conservation area of Old Watchet. An approximate 300 metre level walk will bring you to restauraunts, pubs, small shops, the marina and the West Somerset Steam Railway station. 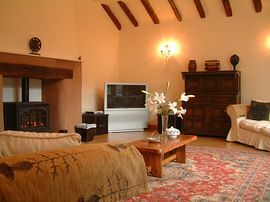 These cottages and bungalows are all 4* rated and offer comfortable well furnished accommodation. The bungalows sleep 2 guests in a twin room and have a seperate lounge, dining-kitchen and bathroom. Each has a private and contained rear grassed garden with out door seating etc. 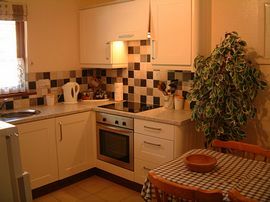 The cottages each have three bedrooms and a semi open-plan layout with newly fitted kitchens incorporating washing machines, fridge-freezer, cooker, microwave etc. Each of these cottages has a bedroom at ground floor level and a further two rooms upstairs accesible in three of the cottages via a spiral staircase. 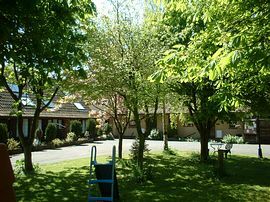 Our guests have the shared use of the heated indoor pool and the infants play equpment and grounds. We personally maintain the cleanliness of the cottages, bungalows, pool and grounds. We live within the courtyard and are here to provide a friendly welcome and offer information about local attractions and activities. Parking for one vehicle per property is within the grounds. Parking for a second vehicle is mostly possible if requested in advance. Thornesmill Court which contains our Thornesmill Barn and The Howe is a two minute walk away from The Croft and all the amenities in Watchet. Both Thornesmill Barn and The Howe were completed in 2006 and offer a luxurious 5* standard. 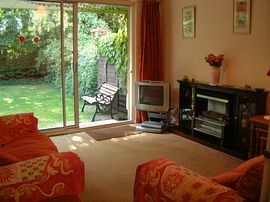 They are clean and comfortable properties making a perfect base from which to tour and explore the beautiful coast and countryside of West Somerset. Each has a fully fitted kitchen with the expected appliances. Each has three bedrooms one of which is en-suite in each property. The Barn has a super lounge of Baronial proportions with an inglenook fireplace containing a gas log-burner, a huge TV and plenty of comfortable seating, plenty of interesting ornaments etc. French-doors open onto a private garden area. There is ample parking for several vehicles. The Howe has a more contemporary feel to it with modern interior and furnishings. Also has french-doors opening onto the garden area. Again there is ample parking. 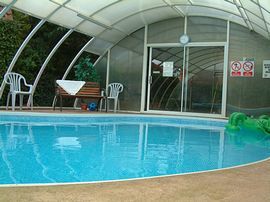 Guests staying in these properties are invited to use the indoor heated pool at The Croft just a two minute stroll away. Most of our cottages are suitable for disabled guests to a certain degree.We have two properties that are newly built/converted and they have wider doorways etc for wheelchair users.We welcome enquiries regarding specific details about our properties and will do our best to answer any queeries. All bed-linen is provided also table-cloths/T-towels/Bath-mats etc. Towels are includedin the pricein our 5* properties. Towel-hire is available in our 4*properties. One well-behaved dog is allowed in each of our 4* cottages/Bungalows. We charge £15.00 per dog per week. We do not permit pets in Thornesmill Barn or The Howe.The usual rules apply with regard to bringing your dog. Smoking is permitted in certain area of our 4* properties.But we prefer guests to smoke outdoors. Smoking is not permitted in Thornesmill Barn or The Howe. On entering the old area of the town of Watchet and crossing the steam railway bridge follow the road around a left-hand bend and turn immediately left into Anchor Street. Make your way down Anchor street until you reach a right-hand bend. On the left here you will see our board. Turn in sharp left and enter the courtyard after going up a short tarmac drive. Croft bungalows: £170.00 - £390.00. Corner Cottage: £250.00 - £675.00. Linhay Cottages: £240.00 - £650.00. The Howe: £380.00 - £790.00. Thornesmill Barn: £460.00 - £980.00. The Croft bungalows and Corner cottage are available on a Friday - Friday basis. The other three cottages and Thornesmill Courts Barn and The Howe are run from Saturday - Saturday.